How can I add an item to the 'new' context menu? When I right click anywhere I get an option to add a new file with a specified extension. I would like to add some custom files into this menu, so I can right click and create a new PHP file for instance. To add extensions of your choice to the list: create a file, add the content below, save it as whatever.reg, and run it. Note: Replace .png with the file extension you want to add and replace whatever with anything you want. ShellNewHandler helped me to restore my Windows 7 shell menu > New > txt document entry. *if the file extension such as .wil does not exist, I would first create a file with that extension and double click it. Open it with the program of my choice as this would then create the other needed registry keys and make your job easier. For removing entries from the list, here is a program which allows you to enable/disable entries from a GUI. Much easier than searching the registry! Unfortunately, it does not allow you to add entries. None of these methods were working for me in Windows 10. I finally found this page that explained that you need to reference another key that contains the name and default icon. This is the minimum needed to create an entry, but it won't have an icon. Oh, and at least for me, just closing and reopening Explorer (make sure to close all instances) is enough to reload the context menu. You don't need to restart the whole machine. Replace xyz with the extension you would like to add. And replace XYZ test file with the name of the file extension (e.g a .scss file would be "syntactically awesome style sheet file”). If you want to use a template file see the explanation below. Will create a new file type in the registry. This will enable you to use a template for all new files of this file format. We could for example write "template.xyz" and make a new file called “template.xyz” and use it a s a template. So each time you make a new file it will be populated with pre-made content. As Eduardo Molteni mentioned the paths for the template files are: %Userprofile%\Templates, %Allusersprofile%\Templates or for the whole system %Systemroot%\ShellNew. In this example we haven’t specified any template name because we don’t want to use any. This will be the name of the file type both for the context menu and the newly created files. As far as I know leaving this value blank does not work. The icon is added once Windows have associated a software with the file type. Double click the file and it will update your registry. The next step, and that is very important, restart your computer directly. So DON'T try to open the content menu to see if it's already works! First restart you computer. cannot be changed to accomplish what is displayed or not displayed on the "New" context menu. If you change that value, it will be overridden by Explorer the next time you right click and bring up the "New" context menu. Try it and you will see what I mean. This information is all officially documented by Microsoft; normally intended for developers who are registering their own new file types. When a user opens the File menu in Windows Explorer, the first command is New. Selecting this command displays a submenu. By default, it contains two commands, Folder and Shortcut, that allow users to create subfolders and shortcuts. This submenu can be extended to include file creation commands for any file type. 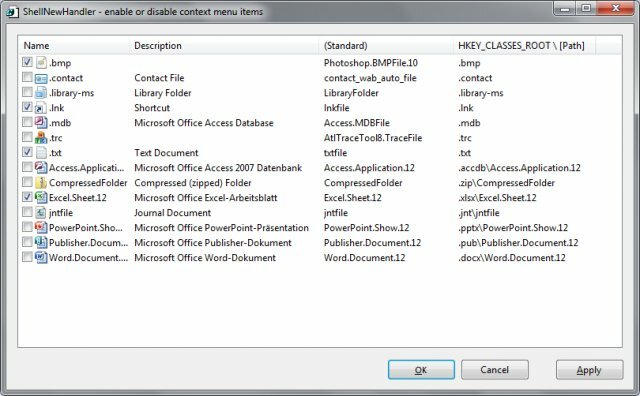 To add a file-creation command to the New submenu, your application's files must have a file type associated with them. Include a ShellNew subkey under the key for the file name extension. When the File menu's New command is selected, the Shell will add it to the New submenu. The command's display string will be the descriptive string that is assigned to the program's ProgID. Assign one or more data values to the ShellNew subkey to specify the file creation method. The available values follow. Command: Executes an application. This is a REG_SZ value specifying the path of the application to be executed. For example, you could set it to launch a wizard. Data: Creates a file containing specified data. Data is a REG_BINARY value with the file's data. Data is ignored if either NullFile or FileName is specified. FileName: Creates a file that is a copy of a specified file. FileName is a REG_SZ value, set to the fully qualified path of the file to be copied. NullFile: Creates an empty file. NullFile is not assigned a value. If NullFile is specified, the Data and FileName values are ignored. 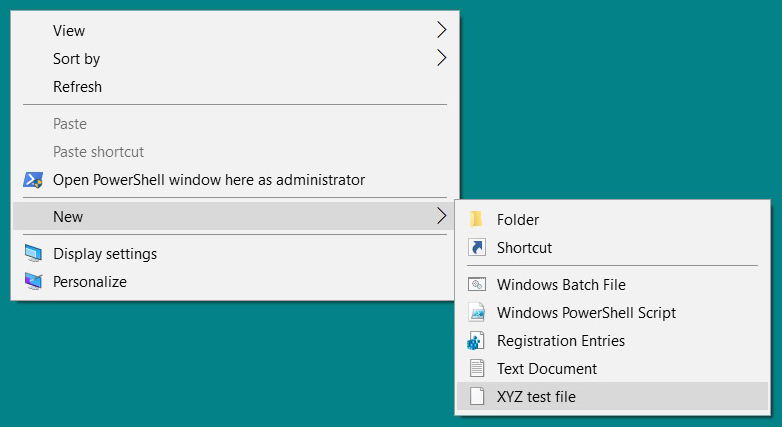 How do I manage what is in the New context menu in Windows 8? How to add New Excel Worksheet in the Right Click New context menu? Add new right click-new options? Is there a way to modify the Windows 7 right click > New menu? How can I add 1 item for several files into `new` context menu in Windows 10? “New Word Document” missing from right-click context menu? How can I add an icon to my custom context menu item in Windows 7? Add Windows Explorer context menu item for SASS --watch option? How can I add an item to the new-context-menu? Can I add a “new -> blank document” option to the context menu?